COURSE INTRODUCTION VIDEO: This video tells students about the course and what to expect. This course is comprised of lessons that make up the grade 8 math curriculum. Students will be prepared to moved on to grade 9 math upon satisfactory completion of this course. This course is intended for grade 8 students and also grade 9 students that need to brush up their grade 8 math knowledge. Students taking this course are expected to adequately master the content of a standard grade 8 math curriculum. 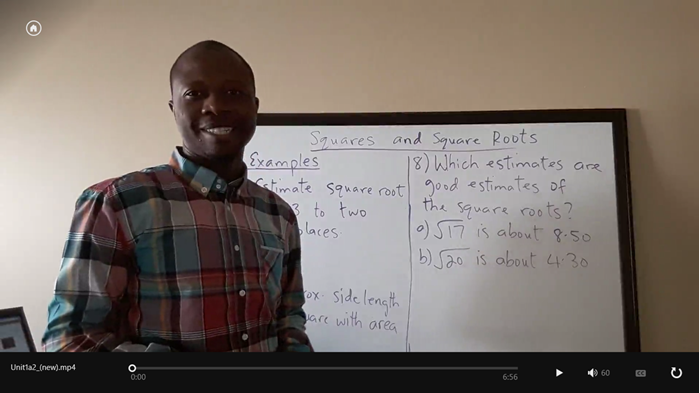 Square Roots and Pythagorean Theorem: Students learn how to find the squares and square roots of numbers. They learn to estimate square roots. In Pythagorean Theorem, students learn to calculate the length of missing sides of right angled triangles. Multiplication and Division of Integers: Students develop rules to multiply and divide integers. Students learn to do order of operations problems with integers using BEDMAS. Operations with Fractions: Students learn to multiply fractions, whole numbers, and mixed numbers. Students learn to divide fractions, whole numbers and mixed numbers. Students learn to solve order of operation questions with fractions using BEDMAS. Surface Area and Volume of Shapes: Students learn to find the surface area and volume of right rectangular prisms, right triangular prisms and right cylinders. Percent, Ratio and Rate: Students learn to convert from/to fractions to decimals to percent. Students learn about equivalent ratios and comparing ratios. Linear Equation and Graphing: Students learn about the meaning of equations. Students learn strategies to solve equations using algebra. Students learn about the distributive property and solving equations with it. Students learn how to create table of values and graph linear relations. Data Analysis and Probability: Students learn to choose appropriate graphs for various situations. Students learn various ways data are misrepresented. Students learn to solve probability problems involving independent events.